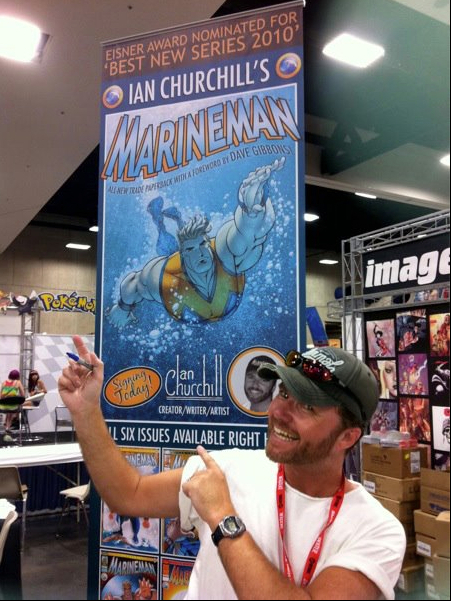 Ian Churchill's Marineman Blog: Revised Post! It's going to be at least another week 'til I get my computer back but I managed to get access to another terminal so here I am! The really exciting news is that Marineman has made the cover of DIVER magazine - North America's longest established diving magazine, and not only that - they have featured a 6 page spread devoted entirely to Marineman! It's making me feel the way I did when I first saw my work published at Marvel Comics! 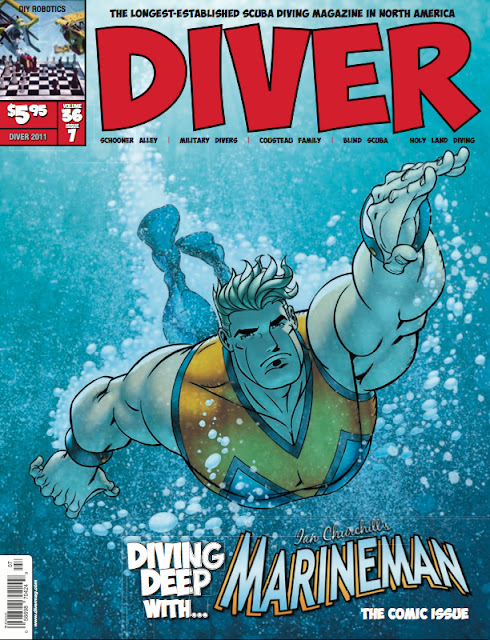 DIVER Magazine - The comic issue! 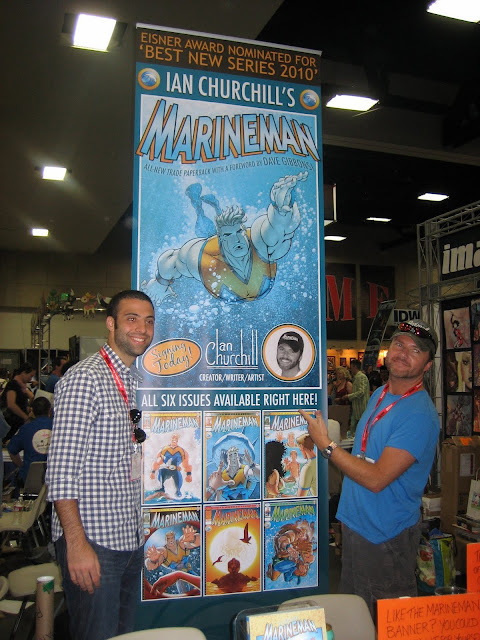 As I said in the previous post, the San Diego Comicon was a rocking show, I got to see hardly any of it as I was at the Marineman booth most of the time, but everyone who stopped by remarked on how huge it was and what a great time they were having. So many friendly people came by the booth with nothing but support for Marineman and the series. I had a lot of fun just chatting about the character and hearing about the character from different perspectives. A whole lot of families stopped by which was really encouraging as we need as many younger readers to get into comics as possible. Quite a few Navy people showed up at the booth too who seemed to enjoy the Navy's presence in the series. A very pretty Navy girl from Florida (whose name I can't remember) was chatting to me while I signed a copy of the trade for one of her daughters and expressed that she'd love it if I could come up with a Navy inspired bikini! She was lamenting on the unflattering/unfeminine attire the Navy issue. So if I find myself with some free time, I may give it a go and post the results right here...! Me, Dennis and his prize! 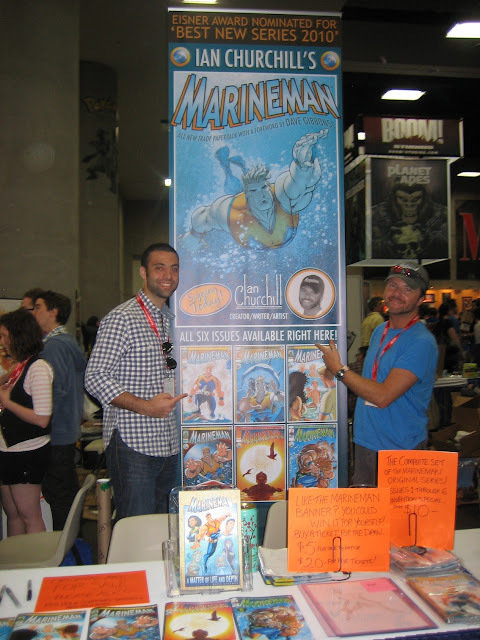 Me and Image Comics' Todd Martinez! Richard Starkings' ELEPHANTMEN take Sea Port Village, San Diego! Cheesy grin and a cool banner...!
" I'll see your beard, Robert - and raise you a baseball cap! " 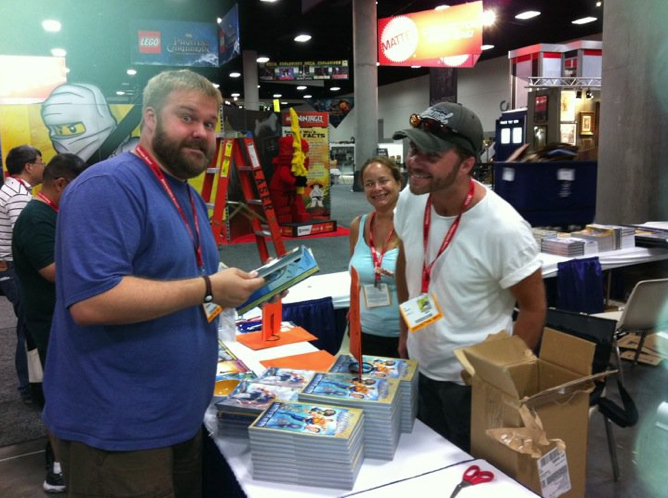 Meeting the big talent that is Robert Kirkman! Massive fan of your work. Sadly, I was unable to attend San Diego Comic Con (though I was lucky enough to meet you at Kapow Comic Con, where you did me the most amazing Daredevil sketch! ), and therefore was unable to pick up a copy of the trade. Does this mean the trade available to the general public now? If not, any idea on when it will be? Whilst on the topic of cons, in a recent issue of 2000AD it said you would be attending Leeds Thought Bubble this year, yet on the website, I didn't see you on the guest list. Any chance you could clear this up? All the best, and I'm intrigued to see your designs for feminine Navy attire! They should be displaying properly now, thanks for the heads up! As far as I know Thought Bubble is a GO - but I will look into it and post on the blog for sure. Srry I haven't put the Photos up. It took me a while to find the right spot for it but I think I found the right spot!! Also, i loved the extras included in the trade. It was awesome seeing all the designs and early sketches. I was curious if you were going to be releasing marineman in any other countries/language? Perhaps in Spain?? Might we be hearing about what you might be working on next?? Thanks again for the awesome banner ian! !